If the typical two-year upgrade cycle holds steady, Apple could be in line for a major "iPhone 7" product cycle, with a majority of existing iPhone users due for a new handset, according to a new survey. 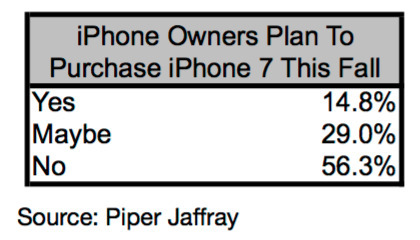 Investment firm Piper Jaffray polled 400 U.S. iPhone owners and found that 67.5 percent of them own an iPhone 6 series or older device. 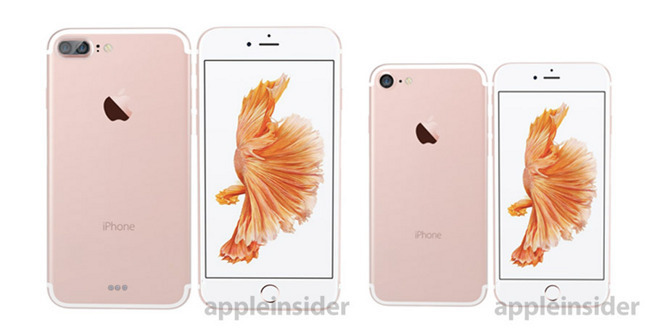 This September will mark two years since the iPhone 6 and iPhone 6 Plus first launched. The most popular device owned by those surveyed was the iPhone 6 (25 percent), followed by the iPhone 6s (21 percent). In all, 31.5 percent of respondents are running an iPhone 5s or older. Among those polled, 15 percent said they plan to upgrade to the next iPhone this fall, and another 29 percent said they are considering a new handset. "We view this as in-line with our expectations given we are still over two months away from the official launch and most consumers are not tuned into the Apple rumor cycle," analyst Gene Munster wrote. "We expect the percentage of consumers that plan to upgrade to the iPhone 7 to increase following the announcement, even if it is not a significant technology upgrade." Munster believes that at a minimum the so-called "iPhone 7" can perform on par with the iPhone 6 and iPhone 6 Plus product cycle from two years ago. That would imply 12 percent year over year growth over the current iPhone 6s cycle. It's expected that this year's so-called "iPhone 7" will ship in September with a thinner design and lacking a 3.5-millimeter headphone port, instead opting to provide audio out through the Lightning port. The larger 5.5-inch "Plus" model is expected to see the most significant upgrades, including a dual-lens camera system, and potentially the addition of a magnetic Smart Connector for charging.